If you want to access the Hawaii State Archives digital collections, just visit the Hawaii State Archives Digital Collections. (If only visiting Hawaii were this simple...I'd love to go!). The records are a combination of English and native Hawaiian. There is a master Name Search for searching across multiple collections -- an excellent tool for you family history buffs -- but be careful...the search isn't comprehensive; you have to search some collections separately to find mention of all family names. The archives include two online exhibitions. 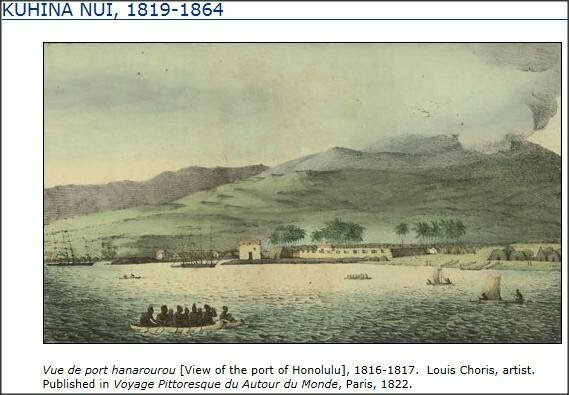 Kuhina Nui, 1819-1864 explains the unique ruling instiutions in Hawaii. The exhibit on Abraham Lincoln details the President's surprising interactions with the Hawaiian nation. The University of Hawaii has an online collection of Thrum's Hawaiian Annual, 1857-1923, a yearly almanac chock full of information and statistics (browseable, but no text searching). Some historical books and directories are also available. UH also offers a small (and not terribly user-friendly) WWII collection, Hawaii War Records Depository Photos. Bet you didn't know that Honolulu was once known as Hanarourou...!